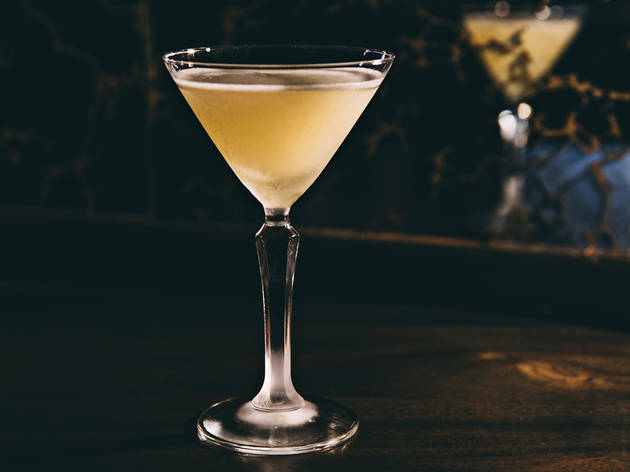 The sultry antithesis to sunny sibling Lonesome Rose, Golden Teardrops delivers impeccable, spirit-forward cocktails in a transportive subterranean space. I can’t stop playing “Golden Teardrops,” the haunting 1953 single by Chicago doo-wop group the Flamingos. It’s beautifully arranged, the kind of nostalgic pop tune you might put on loop while crying over a lost love into a stiff drink—or three. 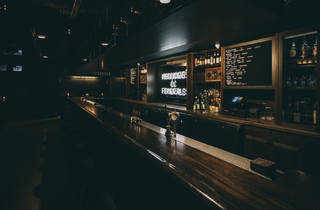 The clandestine basement bar from Land and Sea Dept. 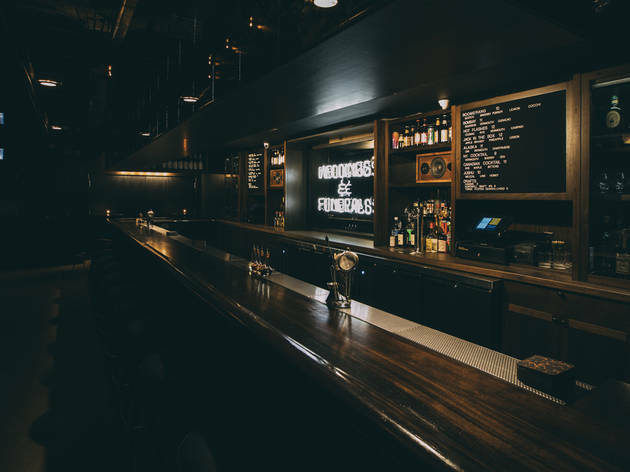 (Parson’s Chicken & Fish, Lost Lake) named for this pared-down R&B hit is likewise stylishly moody, an ideal spot for a cozy nightcap. 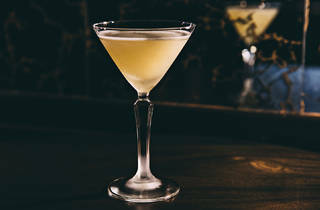 Where I felt doo-wop’s influence most, however, was in barman Paul McGee’s eight minimalist riffs on classic cocktails. My two dates and I began the evening wolfing down tacos at airy, Tex-Mex sister spot Lonesome Rose—highly recommended, as Golden Teardrops traffics in high-proof sips but no food. 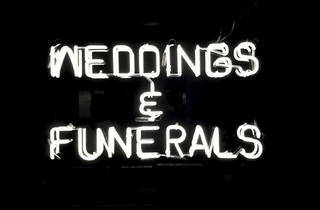 We headed back outside into the alley and down the building’s back steps, where a small black sign assured us we were in the right place. 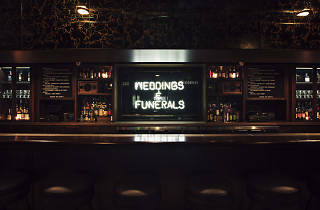 Once inside, this low-ceilinged 40-seater wraps you in the snug semi-darkness of an old Brooklyn cocktail bar, thanks to black walls, vintage gold-vein mirror tile and lighting that consists mostly of votive candles and a jarring neon sign that reads “Weddings & Funerals.” This last photogenic detail—which I’m told nods to the two life occasions that bring friends and family together to seriously drink—buoys the vibe with prevailingly twee dark humor. We nabbed an alcoved table opposite the L-shaped mahogany bar, where I bellied up to order each round (there are no roving servers here). 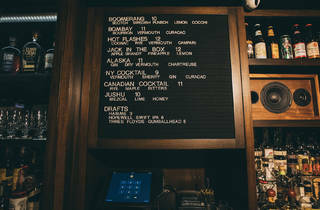 Dual letter boards display the available drinking options: three draft beers and eight three- or four-ingredient cocktails. I like to think that the bar’s doo-wop spirit exists most purely within said mid-century cocktail menu. 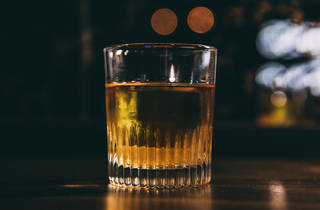 Like musical genres, drink styles are constantly evolving, spawning endless and oft-complicated derivations as their makers experiment with an ever-growing arsenal of artisanal ingredients, techniques and flourishes. 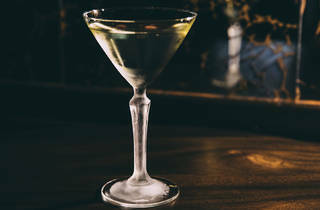 All this boundary testing leads to progress, but there’s also something to be said for the doo-wop cocktail—a crisp, nutty sherry martini, say, or an unapologetically herbaceous Bijou—in which a single, bold spirit belts out a clear melody with little embellishment save for two or three backup harmonizers. 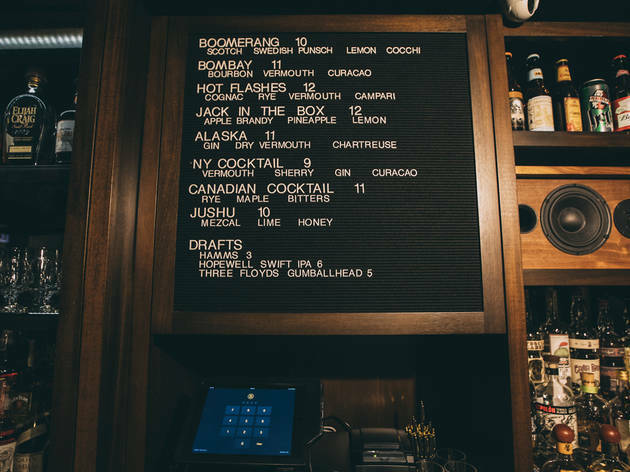 I started with the Boomerang, a tart, scotch-based “whiskey” sour imbued with gently botanical Cocchi Americano and the molasses-like depth of Swedish punsch (a sweet, funky rum-derived liqueur). Spicy-sweet rye whiskey dominated my date’s Canadian Cocktail, an old-fashioned infused with maple and bitters. “I just got the maple!” she cried, after draining the last sip. 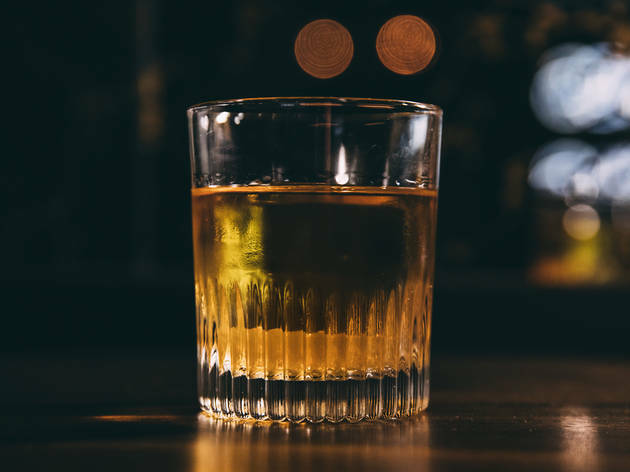 My other date declared the Hot Flashes his runaway favorite, and a near-perfect synthesis of rich, smooth and bitter. 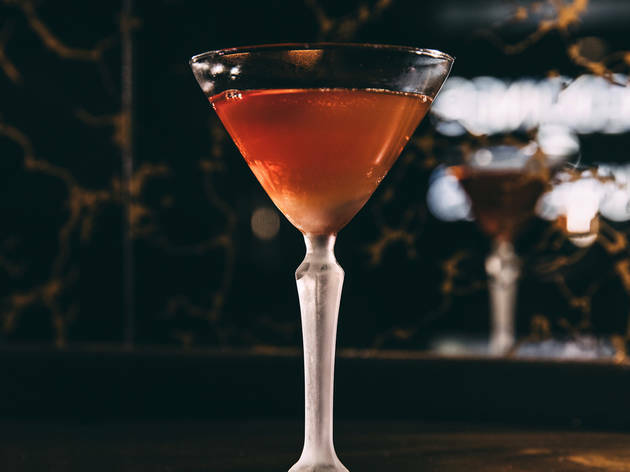 Derived from the elegantly brazen Boulevardier, this subtle variation subs in half the whiskey base with cognac for a richer backbone; then it’s prescriptively embittered with campari and smoothed over with sweet vermouth. 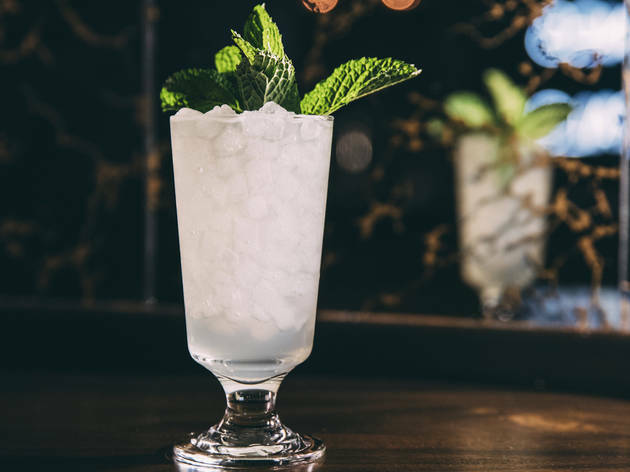 The tropically inclined Jack in the Box, composed of apple brandy and lemon sweetened with pineapple syrup over crushed ice, went down dangerously fast—a “fluke” we blamed on its similarity to an adult juice box. 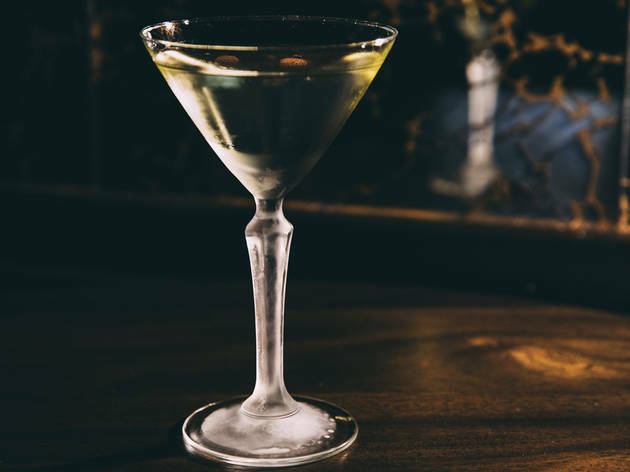 The quenching Jushu’s intuitive blend of honey, lime and mescal also required little reflection, beyond the overly precious observation that the honey’s blossomy sweetness provided the falsetto to mescal’s roasty, vegetal tenor. 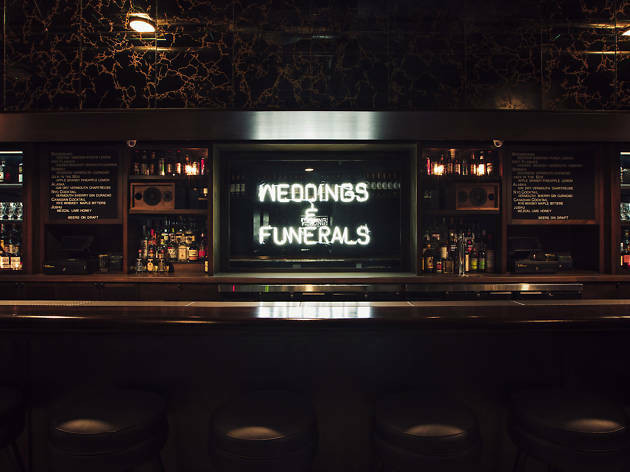 When they weren’t mixing drinks, the two harried bartenders proved impressively adept at relighting blown-out candles around the bar, maybe because they too required every iota of light the place so stingily endows. We kept them annoyingly occupied, accidentally laughing out our candle three times. 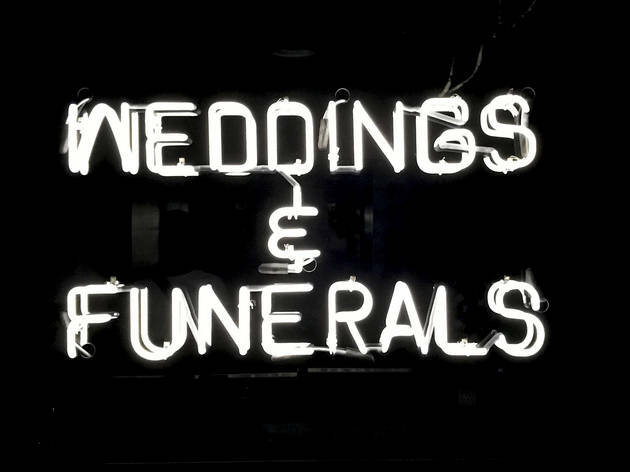 We’d gasp synchronously each time the warm glow disappeared, straining our eyes to adjust to the ghostly blue light of the Weddings & Funerals sign. All the better to Instagram it, I suppose. Thankfully, another delightfully throwback feature of Golden Teardrops is its terrible signal. 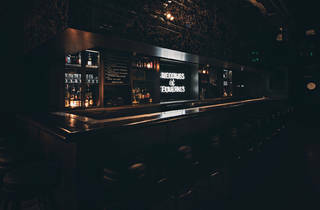 Atmosphere: This hidden bar beneath cheerful Tex-Mex taco bar Lonesome Rose traffics in martini variations and other mid-century classic cocktails, with a moody vibe that’s ideal for an easy date night. Note: Golden Teardrops is only open Thursday through Sunday night. What to eat: There’s no food here, but high-proof sips all but require arriving on a full stomach. 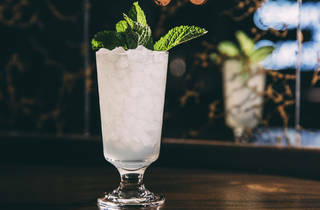 What to drink: Eight quarterly rotating riffs on classic cocktails let bold spirits shine. 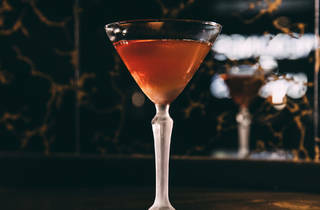 The Boulevardier-inspired Hot Flashes enriches the already-impeccable, smooth and bittersweet cocktail via a split base of cognac and whiskey, while the mescal-, lime- and honey-based Jushu is a breezy refresher. 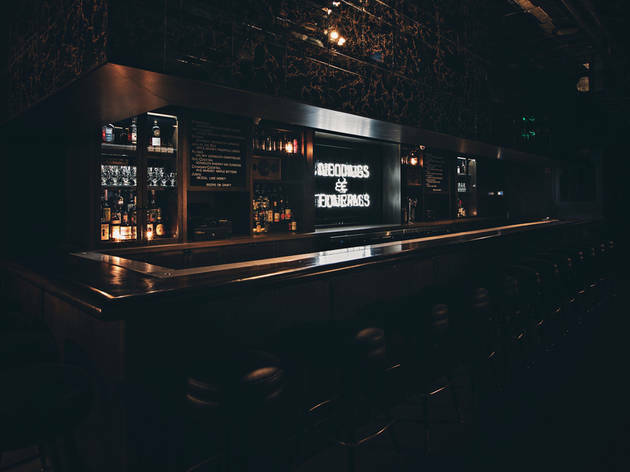 Where to sit: Arrive early to snag the alcoved table opposite the bar, or belly up to the long bar if you’re in the mood to engage the knowledgeable bartenders. A few tables lining the far wall suit smallish groups.